Saturday morning is what most Texans call brisk, temperature 39, winds 4-5 mph. We headed out of Highport Marina and crusied over to the Big Mineral Arm of Lake Texoma. I have to say that with longjohns and a couple of layers of shirts and some coveralls it wasn't too bad. As we eased thru Cedar Mills Marina to get bait we had to pause and check out the beautiful sunrise. The colors were spectacular. 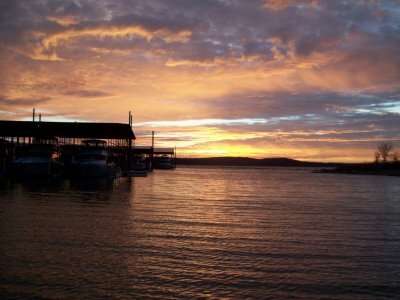 Another one of those "Only on Lake Texoma" moments. We fished off the points and creek channels for a couple of hours. We would set up a drift and catch one or two stripers on each pass. After two or three passes the fish would get lockjaw and we would have to move to a new spot. We caught a good mess of pan sized stripers, no big ones today. After about three hours on the lake it started to get colder, errr, brisker. We tried chasing the birds but they were in the resting mood. 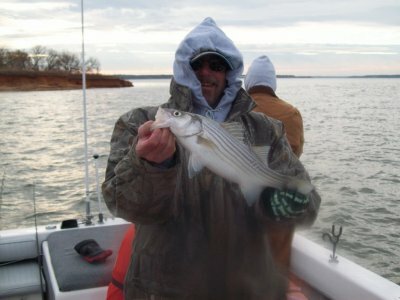 After a trip up to Island View we decided to call it a day and head in for a lunch of fresh Lake Texoma stripers.